With both the pins and the tails cut out, it’s time to fit them together. Watch this video! When you first dry fit the pin board and tail board together, the pins will often leave an impression line on the inside of the tails where they don’t quite fit through. This impression line will serve as a guide for where and how much material needs to be paired down from the tails. 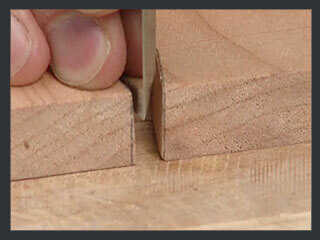 Use a chisel to pair down the tail. Using the impression line as a guide, come down with a chisel to remove the excess material. Note that the bottom part of the tail is tapered slightly. 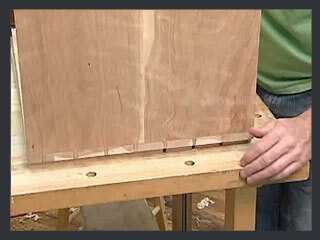 This will ensure that as the pins are inserted, the fit is very tight at the edge, where it will be visible. Repeat steps #1 and #2 for all the tails, press-fitting the pin board and tail board together and pairing the tails until you have a snug fit. That’s it! 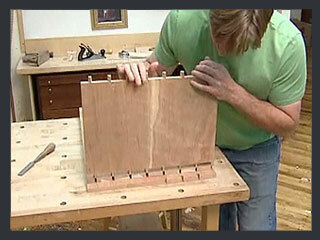 The pins and tails are cut and should now fit nicely together, forming a through dovetail.